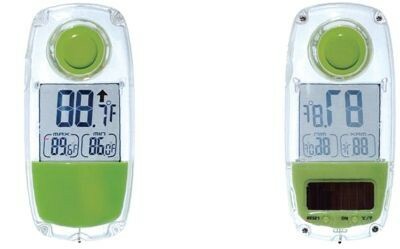 LifeMax Window Solar Thermometer, Lets you see the temperature outside by placing the thermometer on the outside of the window with the suction cup, which attaches to both sides so if you wish you can use it inside the house. Neat little device, exactly what we wanted, but temp shown is a good 4 degrees too high. Phoned to query this, and even before I'd had a chance to send the requested email, they had figured out who I was and made a full refund. Service really remarkable..